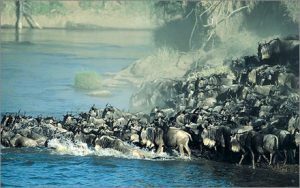 Tempted by greener pastures, the wildebeest arrive at the Mara River around July and cross over into the Maasai Mara plains. Their spectacular northward migration is dictated by weather patterns, but typically the wildebeest remain in the Maasai Mara until about October, when they return to Tanzania. The Maasai Mara National Reserve and Mara North Conservancy are located west of the Rift Valley and are a natural extension of the Serengeti and a key dispersal area for wildlife. Approximately 1.3 million wildebeests as well as hundreds of thousands of other animals, including zebra and gazelle coming from the south make the journey. They are met on the Maasai Mara plains by another migratory contingent, the resident wildebeest herds of the Mara region. These animals reside in the northeast of the Mara, the Loita Plains and Hills, and are also drawn by the lush grasslands. 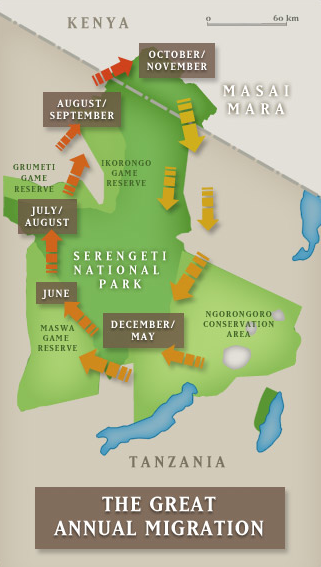 By October, the rains are heading back south to the Serengeti, and the migration reverses, continuing the cycle of life. Less famous, yet very impressive, is the Loita Hills migration, where thousands of local wildebeest drift in from the east in May and often stay in the Mara North Conservancy throughout the year, heading back to the Loita Hills only when it rains again in March. This makes the Mara North Conservancy an all year destination and not just a seasonal environment.